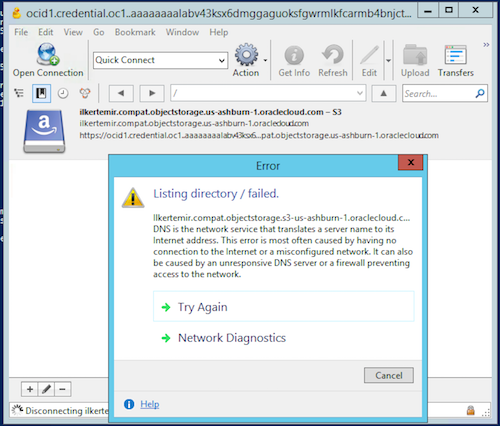 Running Cyberduck on Windows for an S3 compatible endpoint results in DNS failure. Debugging the problem indicates that the connected server is different than the specificed server in configuration. Oddly, this problem does not happen on Mac. Note that configured server is ilkertemir.compat.objectstorage.us-ashburn-1.oraclecloud.com but popup specifies ilkertemir.compat.objectstorage.s3-us-ashburn-1.oraclecloud.com as attempted server (not clear where s3- comes from, this does not happen on Mac). If the server endpoint is namespace.compat.us-ashburn-1.oraclecloud.com and region is us-ashburn-1, this will problem will not happen. If the server endpoint is namespace.compat.us-phoenix-1.oraclecloud.com and region is us-ashburn-1, this problem will happen. Problem is persistent across macOS and Windows. I cannot reproduce this problem with 6.7.3.